 6 Pcs Mini Ceramic Succulent Plant Pots make an excellent gift. Available in 6 Owl styles. Send your guests off with a small token of your appreciation for sharing your special day.  The interior of the pot has a hole at the bottom makes the proper draining of live potted plants. This planter offers excellent all-weather durability.  Ideal size for fern, moss, succulent, cacti or other plants with easy maintenance. Ideal for adding visual interest and wonderful as a housewarming or gift. Size: 2.2 x 2.2 x 2.4 inch (L x W x H). 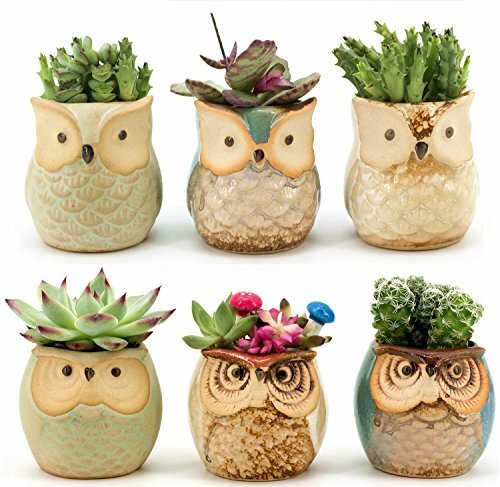 [Modern Design]: Owl shape ideal for adding a dash of refreshingly modern design to your home, delicate ceramic pot can serve a variety of purposes, it's a perfect gift for family and friends who love succulent plants with a green thumb or keep it in your own home for a touch of clean, modern style in your living space. [Product Included]: 6PCS pot, Decorations and plants are not included (Product only flower pot). [Size]: Approximate Size 2.2 x 2.2 x 2.4 inch (L x W x H). The flower pot can hold a succulent plant. [Material & Note]:Ceramic( high quality clay and baked in high temperatures).Handmade products, color and shape may a little bit different. [Special you can see ]: A simple and sleek contemporary petite, Beautifully glazed with elegant, attractive color plant pot. Gardening props, suitable for decorative gardening, desk, bookshelf, dinning table, living room, hosting room and everywhere. If you have any questions about this product by Weierken, contact us by completing and submitting the form below. If you are looking for a specif part number, please include it with your message.